↑ अ आ Reiley, Keith; Burghardt, Michael; Wood, Michael; Ingham, Jay; Lembeck, Michael (2011). "Design Considerations for a Commercial Crew Transportation System". AIAA SPACE 2011 Conference & Exposition. September 27–29, 2011. Long Beach, California.. doi:10.2514/6.2011-7101. http://www.boeing.com/assets/pdf/defense-space/space/ccts/docs/Space_2011_Boeing.pdf. ↑ Carreau, Mark (July 24, 2013). 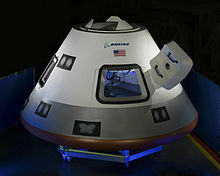 "Boeing Refines CST-100 Commercial Crew Capsule Approach". Aviation Week. अभिगमन तिथि May 8, 2014. ↑ अ आ इ Burghardt, Mike (August 2011). "Boeing CST-100: Commercial Crew Transportation System" (PDF). Boeing. अभिगमन तिथि May 8, 2014. ↑ Krebs, Gunther (April 2017). "Starliner (CST-100)". Gunthers Space Page. अभिगमन तिथि April 11, 2017. ↑ Boeing (September 23, 2009). Boeing Submits Proposal for NASA Commercial Crew Transport System. प्रेस रिलीज़. http://boeing.mediaroom.com/index.php?s=20295&item=849. ↑ "Orbital Complex Construction". Bigelow Aerospace. मूल से July 10, 2010 को पुरालेखित. अभिगमन तिथि July 15, 2010. ↑ Chow, Denise (June 25, 2010). "New Boeing Spaceship Targets Commercial Missions". Space.com. ↑ Clark, Stephen (July 21, 2010). "Boeing space capsule could be operational by 2015". Spaceflight Now. अभिगमन तिथि September 18, 2011. ↑ "Boeing: Crew Space Transportation (CST) System". Boeing. अभिगमन तिथि January 25, 2016. ↑ Lindenmoyer, Alan (2010). "Commercial Crew and Cargo Program". 13th Annual FAA Commercial Space Transportation Conference. February 10–11, 2010. Arlington, Virginia.. Archived from the original on March 5, 2010. https://web.archive.org/web/20100305034240/http://www.aiaa.org/pdf/industry/presentations/Lindenmoyer_C3PO.pdf. ↑ Boeing (August 4, 2011). Boeing Selects Atlas V Rocket for Initial Commercial Crew Launches. प्रेस रिलीज़. http://boeing.mediaroom.com/index.php?s=20295&item=1869. अभिगमन तिथि: October 29, 2011. ↑ Boeing (February 2, 2010). NASA Selects Boeing for American Recovery and Reinvestment Act Award to Study Crew Capsule-based Design. प्रेस रिलीज़. http://boeing.mediaroom.com/index.php?s=20295&item=1054. ↑ Morring, Jr., Frank (April 25, 2011). "Five Vehicles Vie For Future Of U.S. Human Spaceflight". Aviation Week. मूल से May 9, 2014 को पुरालेखित. the CCDev-2 awards, ... went to Blue Origin, Boeing, Sierra Nevada Corp. and Space Exploration Technologies Inc. (SpaceX). ↑ "Boeing, SpaceX and Sierra Nevada Win CCiCAP Awards". SpaceNews. August 3, 2012. ↑ "Boeing and SpaceX Selected to Build America's New Crew Space Transportation System". NASA. September 16, 2014. अभिगमन तिथि April 6, 2015. ↑ Messier, Doug (October 11, 2016). "Boeing Delays First CST-100 Starliner Operational Flight to December 2018". Parabolic Arc. अभिगमन तिथि May 24, 2017. ↑ Klamper, Amy (August 14, 2009). "Company pitches 'lite' spaceship to NASA". NBC News. अभिगमन तिथि September 7, 2009. ↑ Grondin, Yves-A. (August 5, 2013). "NASA Outlines its Plans for Commercial Crew Certification". NASA Spaceflight. ↑ Commercial Space Flight Panel. YouTube.com. SpaceUp Houston. 2011. ↑ Messier, Doug (March 23, 2011). "Update on Boeing CST-100 Crew Program". Parabolic Arc. ↑ Commercial Spaceflight Federation (June 16, 2010). Bigelow Aerospace Joins the Commercial Spaceflight Federation. प्रेस रिलीज़. http://www.commercialspaceflight.org/2010/06/bigelow-aerospace-joins-the-commercial-spaceflight-federation/. ↑ Memi, Edmund G. (September 12, 2011). "Space capsule tests aim to ensure safe landings". Boeing. अभिगमन तिथि September 18, 2011. ↑ Boeing (July 19, 2010). Boeing CST-100 Spacecraft to Provide Commercial Crew Transportation Services. प्रेस रिलीज़. http://boeing.mediaroom.com/index.php?s=20295&item=1323. ↑ Chow, Denise (July 19, 2010). "New Spaceship Could Fly People to Private Space Stations". Space.com. ↑ Test of Rocketdyne abort motor for Boeing crew capsule. YouTube.com. अभिगमन तिथि November 24, 2011. ↑ Norris, Guy (October 10, 2016). "Boeing Delays CST-100, Still Targets 2018 ISS Mission". Aviation Week & Space Technology. अभिगमन तिथि October 11, 2016.